How can you not get all wound up over the World Cup? I mean, with Mexico’s loss and France’s win, and the USA in the Round of 16, what’s not to like? At the end of the day, we may long remember the goals that are scored, but we will soon forget the goals that were saved, and we have the goalies to thank for all of it. Goalies unfortunately don’t get the respect and reverence they rightfully deserve. I mean, for those of us who love scoring, we have to admire and esteem, honor and appreciate the play of the goalies. I mean game in and game out, some of them are turning in some of the most supreme and superlative sessions I’ve ever seen. 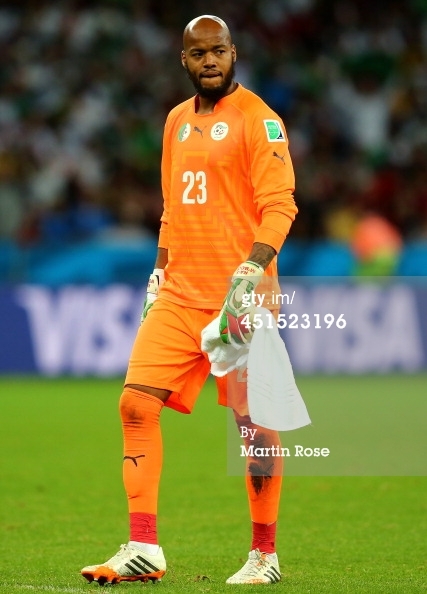 Just ask Algeria’s goalie, Rais Mbohli. Goalies are routinely the most animated players on the field, often seen barking orders to the field players who may or may not be actually listening to the lunatic who AGREED to get pelted with 80 mph soccer balls. Algeria’s Rais M’Bolhi kept the Germans out of his net for the first 57 minutes despite a few close calls, and kept the Algerians in the game while keeping the match closer than it could have been by being mobile, hostile, and agile. Algeria eventually fell to Germany, the team that may well be the eventual champion? As believers, we are to act as goalies, preventing the opposition from scoring on our teams and our troops, our gangs and our groups, and everyone else in between who we care for and care about. We are defenders; we protect and prevent, we shield and we shelter, we safeguard and we are the vanguard – in effect, we work to save. It’s a spiritual concept. Goalies save their teams from losing and from dropping, from being scored upon and from being tallied against. It’s a powerful and sometimes untenable position. But somebody’s gotta’ do it. God is the ultimate goalie and He is our consummate goaltender. Some may contemptuously counter that they have not been shielded and sheltered from many bad and besetting things. But have you ever asked yourself, what COULD have happened had not the Lord been or our side? The old saints were wont to say that God keeps us from “dangers seen and unseen.” Amen to that. So be a goalie. Be a goalie for God. Prevent an offense, put an end to an argument, foil a filibuster, scatter an unscrupulous cluster, fend off a frenzy, avert a disaster, save your sister, befriend your brother, rescue a rival, recover a relationship, mend a marriage, and participate in your own resurrection. The life that you save just may well be your very own.